"Help...I just got my driving test date!" With all of the various driving school websites out there, and there are many, how do you know which driving school is for you and can most efficiently get you to pass your test? Should you believe everything you see on a website? Should you believe everything you read on a website? that have passed their test with us. Keith passed his test in Tallaght with us. Round of applause to Keith everyone. Here are some details of his test...this is just a small representation of the detail we go into when helping our pupils pass the test and how our past pupils feel about their experience with us. There is little doubt on our mind that we have the highest genuine test pass rate in every test centre in Dublin. We're only interested in you and your success. It's simple...we have an astonishing ability to take you through the driving test doors and out the other side with a PASS. People like Kieth for example who, with his driving test imminent, looked at our site and chose us based on that very promise. A promise that we delivered on. 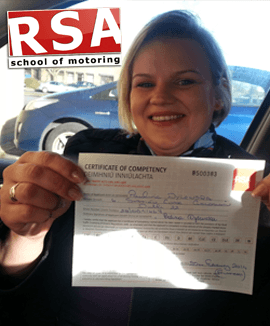 Paulina recently passed her driving test with us. Congratulations Paulina. 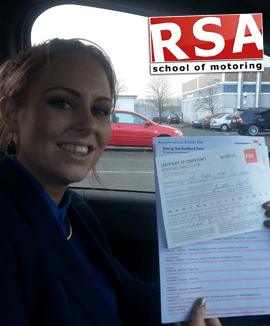 She had previously failed the test with another driving school and was worried the same would happen again. We made sure it didn't. 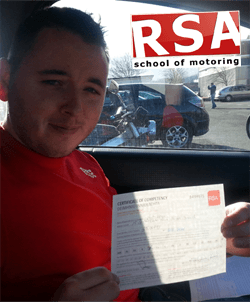 "I would like to say great THANK YOU to Kevin at RSA School of Motoring because I passed my driving test. My story is easy. I failed my first driving test. 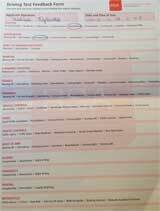 After that I found on the webside the phone to RSA. I ordered 4 hours of lessons with him. That four hours gave me a lot of knowledge. At first He showed me how I should to drive than I had to drive. After few minutes He knows why I did not pass my exam. He is a good observer. He fixed my mistake with excelent result. The most important is that He thorougtly explained me why I did mistake. Good news for people with basic english!!!! He is patient and He is speaking simply and clearly. 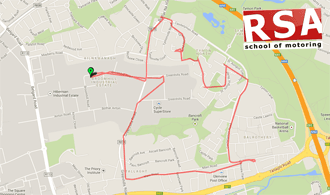 I really recommend the RSA SCHOOL OF MOTORING." Our reputation is spreading fast. Why? Obviously it's because of our pass rates and because we are consistently getting our students to pass their test first time. We really enjoy sharing the experience with you which is why we have built up so many written and video reviews and testimonials. And of course its obvious that our reviews are real. In fact all of our past pupils have given our consent to share their content details with anyone seeking further approval. Andrea passed her test in Tallaght with us after just a few pretest lessons. She was so nervous on the day that she even had a little cry but by the time her pretest was over she was well able for the test and she smashed it. Well done Andrea! We clearly have an unmatched record for success. You can head over to our review page and read more or for those of you that are interested, lets go over our pretest strategy for greater insight into why we are the best at what we do. Be sure to arrive at the driving test centre 15 minutes before the test itself. You will wait in the waiting room until your name is called. When your name is called by the tester you will sit across from the tester at his/her desk. After some formalities and having had your learner permit checked and verified the tester will advise that they are going to ask you some questions on roadsigns and on the rues of the road. The tester will ask about 8-12 questions on the rules of the road and about the same amount of roadsigns. 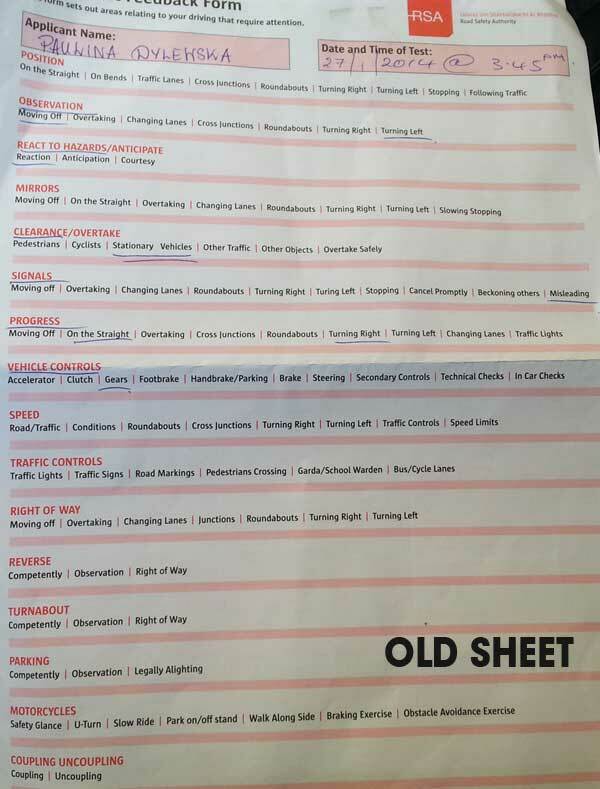 An in depth knowledge of the rules of the road is needed for this part of the test. After the questions the tester will suggest you make your way to the car and you move on to stage 2 of the test. On approaching the car the tester will inspect the windscreen and make sure the car has a valid insurance, tax and NCT certificates. They will also check the tyres have the correct thread depth. The legal minimum limit for tyre tread depth in Ireland is 1.6mm. How you would test the levels of oil in the engine? Where is the coolant reservoir is located? How would you know what the levels are? Where is the bottle washer for the wipers located? Where would you find the brake fluid? After the show me tell me the tester will ask you to close the bonnet and ask you to turn on the ignition and to demonstrate the indicators and brake lights are working properly at the front and rear. The tester will check the front and rear and make sure all bulbs are working correctly. The tester will then sit into the car and the test moves on to stage 3. The tester will then give you an idea on how to proceed and that they will tell you in time to turn left or right...and so the test moves on to stage 4. You have to MAKE THE TESTER FEEL YOU DESERVE the licence by what you show him. The driving test will be carried out over a number of pre-selected routes all of equal difficulty. REMEMBER: This is your time. You have asked the tester to be present so that you can demonstrate and convince them that you are fit to drive unaccompanied on our Irish roads. 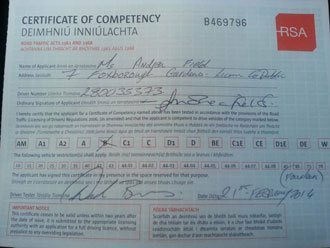 You achieve this by demonstrating the correct procedures and roadcraft which we template out for you during your driving test preparation. Driving perfectly is not what the tester wants to see because it does not exist. You must 'overall' have driven well enough for the tester to feel comfortable to give you the independence to have the full licence based on your performance. If you make a mistake the tester will identify it as a fault. They will then assess the error, rate its importance and if need be note it on the marking tablet as either a Grade 1, Grade 2 or Grade 3, with Grade 3 being the worst kind. Grade 1 is a minor fault, Grade 2 is a more serious fault and a Grade 3 is a dangerous or potentially dangerous fault. 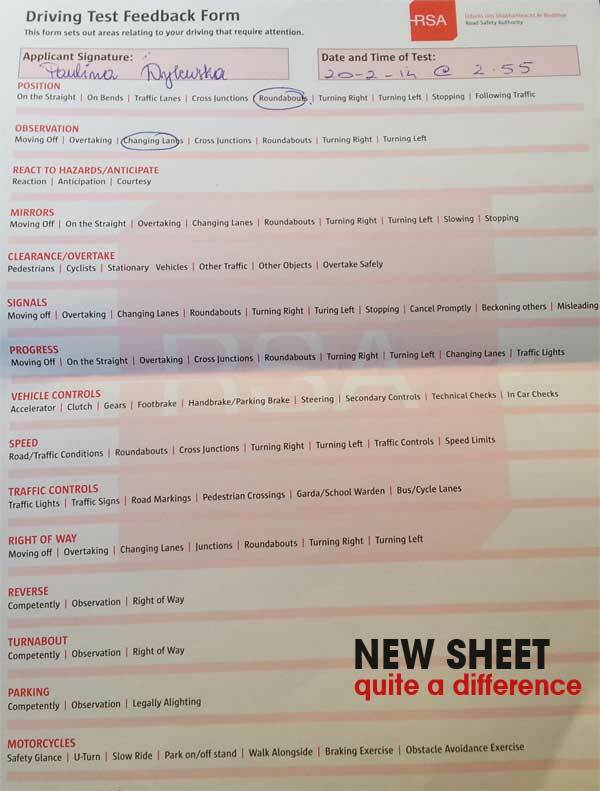 The magic of what we do at RSA school of motoring is in showing you how to get as few marks on your sheet as possible. Sounds simple but this comes from a direct understanding as to what the tester wants you to do and how they want you to do it. If you know what is coming up in any exam you can prepare well in advance. We give you the tips and tricks, the facts and the knowledge to beat the system to prove you deserve to hold a full licence. Of course like any good recipe there is a little secret sauce which you will get to see and taste when you sign up for lessons with us. Just what does the tester want to see and why? 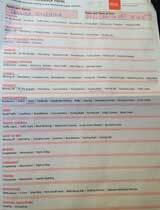 the marking system and pass the test. then you need to book lessons with us today! We will take you by the hand and give you the necessary tools you need to pass the test. 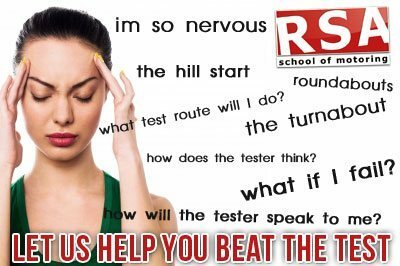 Failing is not an option for us here at RSA School of Motoring and we will work tirelessly with you to get your over the line.